A unique opportunity is being offered to key product and service suppliers to Australasia's wood processing and manufacturing industries. Every two years, the Forest Industry Engineering Association (FIEA) Forest Products Industry maps have been produced. They’ve been produced since 2000 and they’re the only printed mapping resource of their kind in this region. New updated maps are being produced and distributed by FIEA throughout New Zealand and Australia in early 2018. 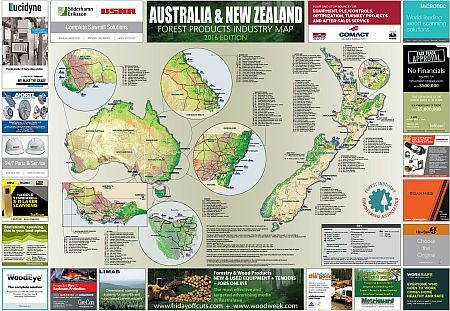 Since first being produced, the large 980mm x 680mm colour FIEA maps have provided the most up to date industry reference for the Australasian forest and wood products industry. They include information on all major sawmills (location, ownership and production) and also show all major wood processing operations including pulp & paper, fibreboard, particleboard, plywood, veneer, paper & paperboard operations, major chip mills, wood manufacturing operations in both New Zealand and Australia. Over 4000 maps are printed and distributed every two years through major industry magazines and the map advertisers. An opportunity still exists for those companies who’d like to be involved in the 2018 industry map. An early opportunity to advertise on the new map was offered to and taken up by a number of the key suppliers and technology providers to the regions sawmilling industry as part of the recent WoodTECH series. However, a few remaining spaces are still available at a discounted rate for a limited period. Actual size: 980mm x 680mm. Booking for the remaining adverts along with positioning on the map will be accepted on a “first come first served” basis. If interested in securing a space on the new 2018 map, please make contact with FIEA’s Sponsorship Manager, Gordon Thomson on gordon.thomson@fiea.org.nz or Tel: +64 7 921 1384 or +64 27 275 8022.